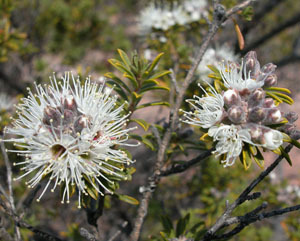 Kunzea ambigua is a tall native shrub has narrow leaves about 1cm long, and grows in sandy heaths in the east and on the Bass Strait islands. 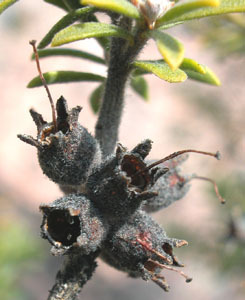 The fruit is a soft capsule (unlike the woody capsules of Eucalyptus, Melaleuca, Callistemon and most Leptospermum spp). The plants are quite strongly honey-scented when in flower.